Joyce Ann "Cissy" Rodgers and I were married in 1973. We moved from Memphis, Tennessee to Quinton, Virginia in 1994. Her mother Nancy Rodgers, sister Janet Thompson, and brother Frank Grimes still live in the Mid-South area. Cissy was born and raised in Memphis. She attended Treadwell High School, graduating in 1969, and going on to attend Memphis State University (now University of Memphis). She attained a Bachelor of Science in Vocational Home Economics Education in 1973. Later, she received a BS in Dietetics and an MS in Community Health. She is a Registered Dietitian and was one of the first to be licensed in Tennessee. She retired from Shelby County government after 20 years service in order to move to Virginia, where she now works as a nutritionist for the Commonwealth of Virginia at Eastern State Hospital in Williamsburg. Cissy is an ASEL pilot, a radio amateur (N4ZRW), and is a Passap and Brother machine knitter. I was born in Oklahoma, lived in the Springfield, Missouri area (Republic) until my teens, and moved to Memphis, Tennessee in 1965 with my family. My father Walter retired to Springfield, where my brother Rex also lives. As for my sisters, Marcia Jones lives in Huntington Beach, California and Judy Love in Portland, Oregon. After graduating from Hillcrest High School, I attended Memphis State University for several years. 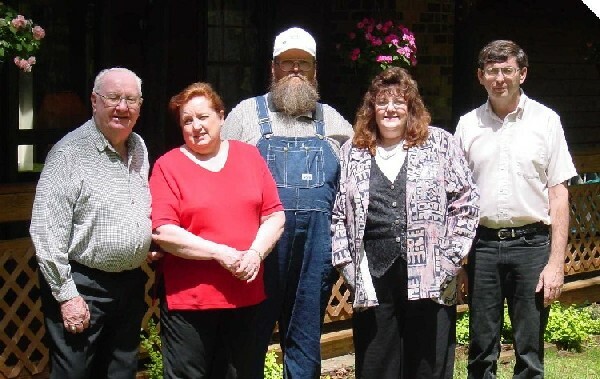 Walter Meier, Judy Love, Rex Meier, and Marcia Jones gathered here in New Kent in April 2002 for a rare reunion.